[Stride]-Stride Step-[Choose one or more cards with the sum of their grades being 3 or greater from your hand, and discard them] Stride this card on your (VC) from face down. [AUTO]:[Counter Blast (1) & Soul Blast (1)] When this unit is placed on (VC), if you have a heart card with "Infinite" in its card name, you may pay the cost. If you do, choose a rear-guard from your opponent's front row and back row, and lock them. Then, if the number of cards in your damage zone is four or more, the cards locked by this effect cannot be unlocked during your opponent's next end phase. Can we really not get a generic Star-Vader G-Unit? This one, like the others, needs a certain Star-Vader as a heart, in this case, Infinite Zero Dragon. When placed on VG circle, CB1 and SB1 to lock a front row and back-row unit, then if you have 4 or more damage, Omega Lock them. What a pain. Needing a certain heart that cannot even be searched. Well, it's not terrible at least: I'd pay that cost to help set up a Triangle Lock with the aid of Photon or Dust Tail Unicorn, and it's not like the most viable alternative (Chaos Breaker) is bad. But I don't really like how this is forcing non-Messiah decks to conform to one type of G-Zone with all the heart restrictions. Actually pretty good, if a bit inflexible in its uses. Oh, hey, Infinite Zero Dragon, you came back! So, if you have an "Infinite" Vanguard and have four damage, CB1, SB1 to do Infinite Zero Dragon's Break Ride skill, and if you're at 4 or more damage, those units are Omega Locked. 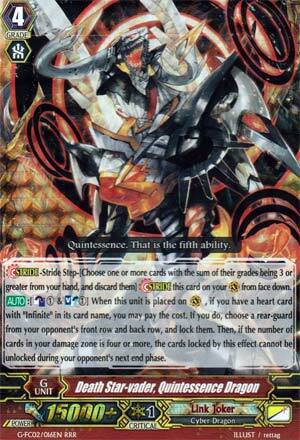 You can ask the people in my locals how much they'd hate the thought of me having this in my Link Joker deck. Anyway, I like it, it's pretty good, IMO, so, if you've got a Link Joker deck with Infinite Zero Dragon, well, here you go.